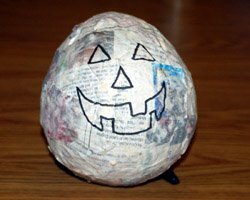 These paper mache pumpkins are made from balloons wrapped in newspaper strips that have been dipped in a mixture of flour and water. This project does take some time depending on how many pumpkins you would like to make. For me, it took about 30 minutes to wrap up each pumpkin in paper mache. The pumpkins also have to be allowed to dry for 2 to 3 days. 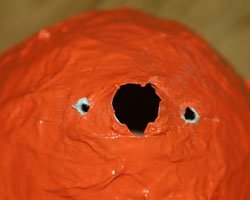 Once dry, the balloon is popped and a face is carved with an exacto knife. 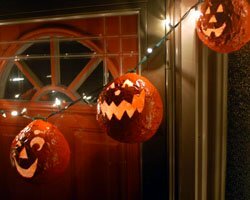 The pumpkins can then be painted and hung along a string of lights. If you take good care of them, this decoration will last for many years! A balloon for each pumpkin, small or large, you choose. 1. Decide where you would like the pumpkins to dry and get that area ready. If you do it indoors, protect the floor in case there is dripping. Tie a length of string to allow the pumpkins to dry on (like a clothesline). 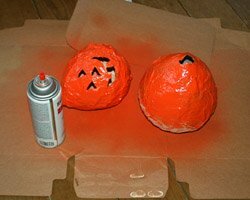 Begin the paper mache pumpkins by blowing up all the balloons, one balloon for each pumpkin you would like to make. Then, tie a length of string to each balloon. 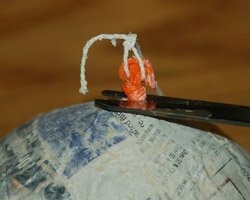 This string is just used to tie the balloon to the clothesline and later it will be cut off. 2. Prepare your newspaper strips in advance. 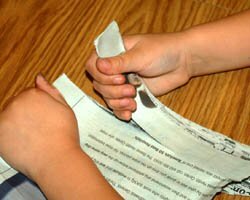 Simply tear about 1 inch wide strips of newspaper and put them all in a big pile. Do not make them too long, as it will be hard to wrap them around the balloon if they are too long. This big pile shown here was enough for me to cover five balloons. 3. 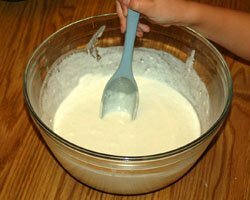 Prepare the paper mache mixture. 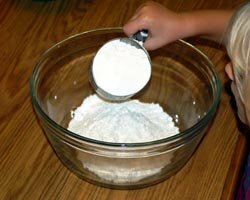 Mix 2 cups of flour to 2 cups of water and mix until it is smooth. You may have to make more of this depending on how many pumpkins you make. 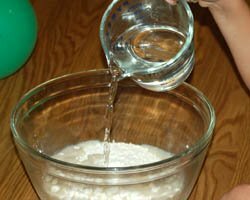 For example, to do the five pumpkins shown in this project I needed 4 cups of flour to 4 cups of water. 4. 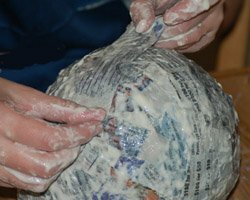 Dip a newspaper strip into the paper mache mixture until it is completely soaked, and then run your fingers over it to remove excess paper mache. Then, wrap the strip of paper around the balloon. Protect your work surface if you need to. 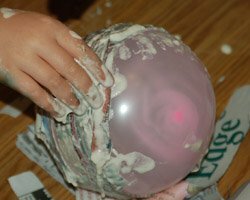 This is a messy job and the table you are working on will get messy, but usually it will wipe up easily later on with a soapy sponge. 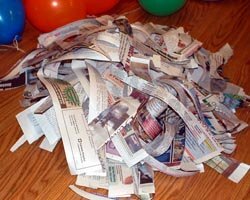 Cover the entire balloon with newspaper strips, overlapping then when necessary, so you cannot see any of the balloon. You can leave the stem pointing through. The goal is to cover the balloon with three complete layers of newspaper strips. I found the easy way to keep track of the layers is as follows: The first layer is easy; you will know you are done when you cannot see anymore of the balloon. For the second layer, add drier newspaper strips on top of the already wet strips to help keep track. For the last layers, layer on wet gooey strips once again. 5. When you are finished, use the length of string you tied to each balloon and tie it to the clothesline you prepared. Allow the pumpkins to dry completely. This may take 2 to 3 days. When they are dry, remove them from the clothesline and cut off the balloon stem. 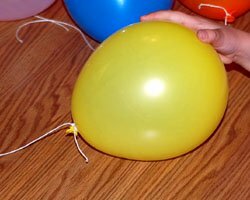 The balloon will slowly peel away from the sides so it can be removed. 6. Draw a jack-o-lantern face on each pumpkin with a marker or pen. Don't worry if you make mistakes, everything will be covered later with paint. 7. Cut out the jack-o-lantern face with an exacto knife, much the same way you would do if you were carving an actual pumpkin. Do not allow children to do this step, the exacto knives are sharp! There is no need to hide the lines you drew, since you will be painting the pumpkin next. Try to remove the pieces as they fall into the pumpkin if possible. 8. Take the pumpkin outside and give it one or two coats of orange spray paint. Or, paint it with acrylic paint with a paint brush. 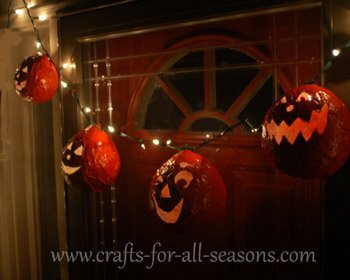 Allow the paper mache pumpkins to dry completely. Apply a coat of Mod Podge to seal them, if desired. 9. 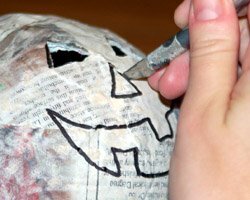 Your paper mache pumpkins are almost done! 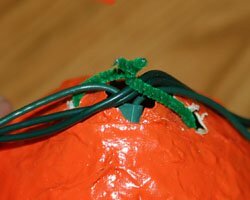 To hang them on a string of lights (or any other garland or string) cut two small holes on either side of the top hole that is on the end of each pumpkin. You can then use a pipecleaner to thread through these two holes and secure to the lights. The tiny light bulb can fit inside the top hole where the balloon stem was. Enjoy!